During Dwight’s affiliation with USC, he was away for two periods. From 1956-1957 he was a Research Fellow at the Haskins Laboratories in New York. During this period, Dwight, Louise, and their daughter, Ann (ages 7 to 8), lived in Blauvelt, New York, in a home that was said to have belonged to George Washington’s gunsmith. 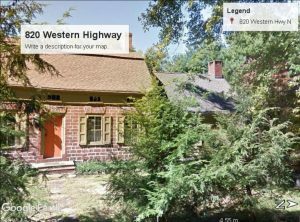 Research by Ann McClure found that Abraham M. Blauvelt repaired guns and watches in this house around Washington’s time, and rented boats on the Hackensack River in the rear (where she fell through the ice!). The Blauvelt family occupied the house for 135 years. She felt that his had to be the house where she and her parents lived because of (1) the gunsmith story, (2) the small unusual openings over the front windows, which she recognized, and (3) what looks like what might have been the barn to the right and behind the house — its correct position in her memory, and note the large chimney that could be for a barn. House where the Bolinger family lived from 1956-57 in Blauvelt, NY. Buff Orpington hen. Source: YouTube. A fond memory of their home in Blauvelt was “Josephine”, the chicken who came with the house. “Josephine” liked company and would perch on their porch railing to be near them. Writing on Oct. 6, 1956, Dwight wrote to his father, AJ Bolinger, “Did I tell you that we have one hen, who is queen of the walk? A Buff Orpington, I think. She delivers one egg a day. Unhappily she has a taste for wild onions, and our eggs come pre-seasoned. The first good frost should take care of that.” Writing again on Nov. 16, 1956, he said, “Did I tell you that Josephine perches on the railing of our front stoop, where she can peer in the window and watch us at night? 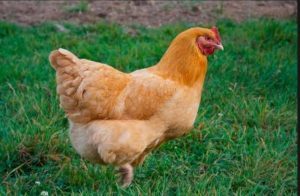 It also puts her at advantage in the morning to cluck for her breakfast.” Sadly, poor Josephine was killed by a snake after they moved back to Los Angeles. “I went in to town for the first time Thursday. It is a tedious trip and I don’t have the hang of it yet. Most of my time has been spent watching one of the old-timers work at the machines, especially the pattern-playback, which sythesizes artificial speech. The men doing the speech work here have been mostly engaged in trying to find what are the signal-carrying parts of what we hear. A picture of live speech shows a lot more frequencies of sound than are needed to convey a message, and they have been slowly stripping it down to minimal essentials. “Their work has commercial applications in telephonics in that it points the ways for narrowing the channels that have to be used in communication–this enables the telephone people to transmit more on their cables while charging you and me the same rate. Actually the Bell people have not used Haskins research to any extent yet, though there is some connexion–not a financial one, however. Dwight and Louise’s son Bruce remembers visiting Dwight at the Haskins Laboratories. The equipment Dwight was using reminded him of cartoons of that period of computers, with an imposing bank of switches, dials, speakers, and the like. Dwight was working with a clear plastic belt that passed over two spools and under an electric eye. The belt was subdivided into sections, the sections representing different sound frequencies. When Dwight first operated the machine for Bruce the speaker produced a robot-like voice with no intonation whatsoever. Then, after Dwight added a few brush strokes to the appropriate sections on the belt, the voice from the speaker began to sound like an ordinary human’s voice. “The series of lectures was inaugurated in 1933 under the auspices of the Graduate School. The lecturer is chosen each year by a committee of the faculty of the Graduate School. 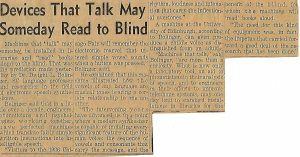 “During 1956 and 1957, Dr. Bolinger was invited to engage in research activities at the Haskins Laboratory in New York City, a research center established to help the blind. “Dr. Bolinger had done research on the nature of intonational patterns, pitch, inflections and their relationship to meaning in languages in general. “His investigations led him to believe that there is a relationship between the basic elements of speech and the expression of common human emotions, regardless of differences in lexicon, semantics or structure.